While the details of each conspiracy theory vary, they typically involve attributing excessive power and influence to a small group engaging in nefarious activities. A classic example is the notion that NASA faked the moon landings. There are also many “false flag” conspiracy theories that range from the idea that the Bush administration was behind the 9/11 attack to the idea that mass shootings are faked to the claim that the pro-Trump stickers on the mail bomber’s van were placed to frame Republicans. There are also various medical conspiracy theories, such as those fueling the anti-vaccination movement. There has been considerable research into why people believe in conspiracy theories. An intuitively plausible explanation is that anxiety and feelings of a loss of control lead to accepting such theories. Ironically, people who embrace conspiracy theories seem to be less inclined to act to counter the perceived conspiracy, perhaps because they feel helpless in the face of such imagined power. This is not to say that this always holds true—the conspiracy theory about Hillary Clinton running a slavery operation in a pizzeria led to a concerned citizen shooting up the place. 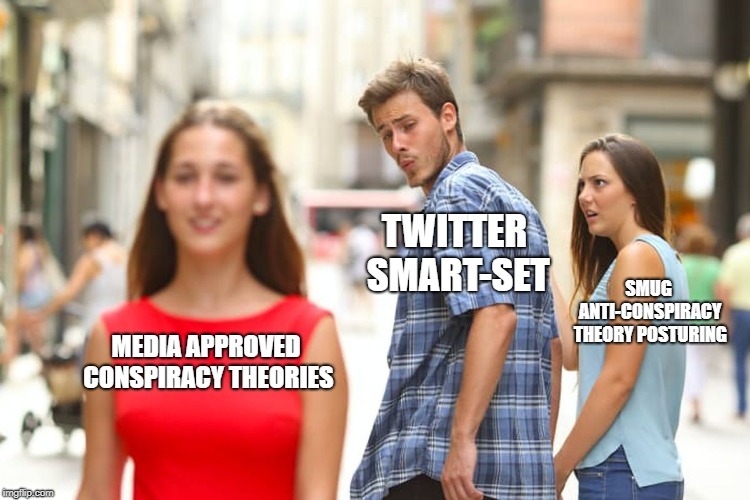 It is certainly tempting to embrace the stereotype of the conspiracy theorist: someone immune to logic, oblivious to opposing evidence and perhaps suffering from mental illness. To broadly dismiss conspiracy theorist using this stereotype would be an error, though it certainly does apply in some cases. My contention is that some conspiracy theorists use the same tools of logic and reasoning as everyone else and I will endeavor to show that this is true. Premise 1. Person A is (claimed to be) an authority on subject S.
Premise 2. Person A makes claim C about subject S.
Conclusion. Therefore, C is true. This reasoning is inductive (the premises provide a degree of support for the conclusion that is less than complete) and its strength depends on the quality of the authority/expert making the claim. If the authority is qualified to make reliable claims in the subject area, then the argument would be a good one. For example, believing that this is what an argument from authority is because of my expertise as a philosophy professor who has taught critical thinking/logic since 1989 would be good reasoning, If the alleged authority is not qualified to make reliable claims in the subject area, then the argument would be a fallacious appeal to authority—the premises would fail to properly support the conclusion. For example, if you believed what I said about quantum theory because of my alleged expertise, then you would fall victim to this fallacy—my expertise in philosophy does not confer expertise in quantum theory. Most people who rationally believe any theory believe it based on an argument from authority—the exceptions are those who are experts in the theory. For example, most of us believe in the theory of relativity because of Einstein and other scientists, not because we have done the research ourselves. In the case of conspiracy theories, believers often use an argument from authority: they believe the theory because an (alleged) expert has told them it is true. For example, those who accept the anti-vaccination theory point to the infamous paper that asserts a causal link between vaccines and autism or they believe because a celebrity they admire tells them vaccines are dangerous. Those who dislike Trump and believe that Putin has a urination tape as leverage probably do so because they heard the account from a source they want to believe. As such, for almost everyone the reasoned belief in a theory is the result of an argument from authority. So, then, what is the difference between the conspiracy theorist who believes that vaccines are dangerous because of what a celebrity says and a person who accepts relativity because of what Einstein said? The difference, in general, is that conspiracy theorists tend to fall for fallacious arguments from authority as opposed to accepting well-founded arguments from authority. For example, believing that vaccines cause autism because of a debunked paper or because of what an actor says would be to fall into this fallacy. After all, unless the actor is also a medical expert on vaccines what they say about vaccines has no logical weight. If all these conditions are met, then the conclusion is probably true. However, since the argument from authority is inductive it suffers from the classic problem of induction: even if all the premises are true, the conclusion could still turn out to be false. “Probably true” sounds like an oxymoron in the context of a discussion of critical thinking, but even allowing for informality, these methods as stated do not provide enough to rise to the level of truth claims. Point 3 – “adequate degree of agreement among the other experts” – is a bit vague, but can reasonably be adjusted according to the case. Point 5 – “The area of expertise is a legitimate area or discipline” – however, misses a critical element: an area may be legitimate and yet have no claim to truth. Counterexample: high energy physics theory, If you asked physicists in this area what underlies the Standard Model, you would get an “adequate degree of agreement” that the answer is String Theory. You could ask more specific questions, and their answers would be based on string theory. Is string theory “probably true”? Does the lack of positive results from predictions at CERN make it more or less “probable”, or does it just mean that physicists might speak with less certainty? This is a very clear example, but throughout various areas of science, there are areas where truth is well established by repeated experiment and observation, and areas where hypotheses are well accepted, but lack rigorous underpinnings. In half of psychology and social psychology, many areas of medicine and dietetics, genetics, atmospheric physics, the area may be legitimate but without the degree of certainty needed to answer some questions to the level of “probably true”. Many things may be known with a relatively high degree of certainty; others not. The best we can say is that it is the dominant answer in the field. Experts may overstate their certainty; they certainly have an inbuilt motive to. In physics, there are at least ways to work towards testing or falsifying the truth of an answer. When we consider fields with less ambitious aims to truth, like politics, sociology, and economics, the problem gets much worse. An argument from authority can be assigned no truth value without considering the quality of the underlying evidence on which that authority is based, and its track record in making predictions if relevant. Your algorithm would be improved by adding this as a qualifying condition to step 5. When we consider non-systemic truth claims, such as how JFK was shot, or more routinely, how any murder happened, all we can do is judge on the basis of evidence available. I never really considered what are called conspiracy theories before, but at first blush, they seem to be of different kinds, possibly deserving different treatments. There is no logic one can use to dispute conspiracy theories because those who believe them have an emotional need to believe them. This emotional need is usually tied to a sense that they were previously wronged in some way. They feel that they had been a victim of those behind the supposed conspiracy, or that those behind it are their enemies thus anything bad that happens to their enemy must be rationalized as an elaborate false flag constructed to either gain sympathy or to do an even greater evil than whatever supposed evil they attributed to said enemies in the first place. You cannot reason people out of something without addressing the reason that they believe that something. And when that reason is emotional, it’s a fool’s errand and the best you can hope to accomplish is to stop or at least slow the spread of the virus. Worse, those who see political and similar advantage will aid and abet the believers in their delusion using their own justifications that the better good is being served. Some of those in the latter group even teach ethics at universities. Thus the need to address the growth factor. Go figure. But as I said before, Groundhog Day. 1). There is a conspiracy of oil companies to deny the science of AGW. 2). AGW is a conspiracy of client scientists to extract money from taxpayers. Who believes which is the conspiracy and which is the truth? As an aside, are these two items mutually exclusive? No, of course they’re not mutually exclusive, and we can be certain that both are at least partially true. One of the most common errors of thinking is assuming a general topic is either true or false. In any large organisation or other milieu, there are many actors, many strands, many interactions. There is no centralised Fossil Fuel Legion of Evil. There is no Green Blob Prefrontal Cortex. There is no central council directing minions what to say and do on either side. In that sense, there is no single organised conspiracy. Instead, we have many people in many organisations around the world acting in what they consider their best interest, alone or in co-ordination with their fellows. Where there is a confluence of interest, an explicit conspiracy is redundant. We have some very public evidence of collusion to mislead from both of those general directions, and we will never know what happens inside the secret IPCC selection process, or among OPEC and oil distribution participants, and we will never know exactly what transpired in that pivotal meeting betwen Santer and Strong before AR2, and in the days after. Since this is now one of the most lucrative areas in the world, both for science – the US Government alone has dropped something like $150 billion on GW research since the scare started, which is huge for an area of science – and, more obviously, for industry, it would be surprising if we found eveyone involved acting with full integrity. Marketers inside Apple are conspiring to make buyers feel that they can’t live without their next fondleslab, political campaigners are conspiring to slant coverage, corporate staff are conspiring to present their companies as public-spirited, particle physicists are conspiring to promote the idea of a bigger collider. These are all just the everyday conspiracies that we know are going on, even when we don’t know the details. Business as usual. Remember the X-files with the “I want to believe” poster in Mulder’s office? People believe things they want to believe. Relatively few people care about truth. I wonder if Mike understands that Rachel Maddow is equivalent to Alex Jones? Sometimes it’s not about the authority figure, it’s about what’s being done with it, and who benefits from the outcome. Meanwhile, authority B, equally credentialed, says the complete opposite – refutes authority A and trots out his own boxes of data and graphs and computer models, and explains in great scientific detail why Authority A is wrong. Then Authority A attacks Authority B, explaining not only why his data models are wrong, but that B has some hidden agenda – namely profit motivation – suggesting that his findings have been “bought and paid for” – thus introducing the idea of a conspiracy. Not to be outdone, B has his own opinions on “hidden agendas”, namely, “government control” and another step towards the government taking over the energy sector, or using this panic as an excuse for taxing or otherwise extracting money from the big corporations (whom their base despises), and redistributing it to the smaller, less-well-heeled, or even to countries that are on their short list to support. So frankly, I don’t have a clue what all the science indicates. I see one set of graphs, and they make total sense to me – and then I see the other set and they, too, seem plausible. I don’t know these guys, so I don’t know who is a more distinguished authority – do I believe NOAA, a sub-agency of the Dept. of Commerce, who says that my very breath is contributing to the destruction of the planet? Or do I believe the founder and ex-president of Greenpeace, an agency that is deeply rooted in environmental issues in a very radical process, who says that AGW is a massive hoax pushed by corrupt scientists “hooked on government grants”? The bottom line is that all of the logic you present is completely meaningless to me. Well, they all seem to be experts to me. The credentials on both sides are pretty impressive. Ditto. Yes, yes, I know all about “consensus” and statistics, but there’s some question about the expertise of those who are in agreement, relative to the definition of “climate scientist” versus “scientist” – and a lot of this nuance is glossed over in the reports. How can we tell? There is a HUGE potential for bias on BOTH sides – how do we know if we are getting an unbiased opinion? According to Patrick Moore, the scientists promoting the theory are being bought by government grants … (see “Free Speech on Campuses” debate). According to Michael Moore (no relation – at least I don’t think …), the scientists on the other side are being bought by the interests of “Big Oil” profiteers, who have a too-powerful lobby in Washington. It is in most cases, and on both sides. Both sides also have their own cohort of somewhat suspicious experts in equally suspect disciplines. Lots of named names on both sides, lots of peer-reviewed, academic studies on both sides with impressive names, impressive credentials – also lots of “Scientist who prefers to remain anonymous” on both sides too. So I resort to looking at results and motivations for this one. I guess the first area of suspicion for me is the whole idea of carbon credit trading, and what the various governments of the world are actually committing to here. Carbon credits and carbon offsets are doled out based on some formula that has its roots in “fairness”, meaning that some entities have more than they will ever need, and others (like “Big Oil”) don’t have nearly enough. So there is an international auction market that is created, where these credits and offsets are traded. (A “credit” is an allowance to produce one ton of carbon; an “offset” is some green energy alternative that will offset the production of carbon. So for example, a wind-farm may produce a bunch of “offsets” they have no need for – so they can sell them to a company like Marathon Oil, who needs some offsets – kind of like capital losses or other tax deductions – to reduce their total carbon footprint). Either way, it comes down to a redistribution of wealth. Large companies cannot invest in their own infrastructure or R&D, even though they know that it makes good economic sense to invest in green energy research (for reasons having to do with profit rather than compliance, but that’s a pretty good motivation). So they have to take their profits and pay smaller, less successful companies or even governments for the fact that they are not producing up to the levels they are permitted. For further reading, read “Atlas Shrugged”, by Ayn Rand. And this wealth redistribution fails to actually reduce the total amount of carbon in the atmosphere – it actually allows the same levels to be produced – it just makes the big producers pay for it. Sorry, but my gut tells me to “follow the money” and “follow the power”, and it’s all pretty lopsided and based almost entirely on panic. I have to believe that most Americans are like me – we don’t understand the graphs and numbers, we can’t audit the science ourselves, and both sides present some pretty credible evidence – so it comes down to passion, panic, and politics. And to add to my suspicion, I did grow up in the 1960’s and 1970’s, and as a youth, was very, very passionate about “Global Cooling”, and the panic fueled by the government and the complicit media that we were headed into a similar global apocalypse, for which only a similar anti-capitalist Democrat “Great White Hope” could possibly be our salvation. So maybe I’m biased. Maybe my suspicion, my adherence to my side of this particular “conspiracy theory” falls into lock-step with my political leanings and the trust (or lack thereof) I have in global politics, but I have to call it as I see it. To me, the Global Warming Crisis of the 21st Century is not much different from the Christian Reformation – something out of our control is coming to get us, it’s our fault, but the government (or the Church) can be our salvation if only we change our ways – and in doing so, of course, convert to their way of thinking, give them more power and control over our lives. So by all of this, I am just pointing out that while your logic may apply in some theoretical cases, in areas that matter it might just be prudent to look at results. And of course, in light of all of the above – our most staunch proponents of this crisis are still driving around in SUV’s with convoys of aides and Secret Service in their own SUV’s, are still flying in private jets around the world, and for the most part adopting a “Do as I say, not as I do” attitude. Frankly, I’d be more inclined to trust someone like Ed Begley, Jr, who has made for himself an entirely self-sufficient lifestyle, but who is largely considered to be a wack-job. Al Gore, on the other hand, has become a multi-millionaire on the basis of this crisis. So again, lots of legal minds and pundits on both sides, lots of seemingly valid arguments by well-credentialed people offering all kinds of insight into Why They Are Right And Just Wait Until the Mueller Report Comes Out. So following your six-step program, how do we tell? Again, I threw all of that out myself, and asked myself the question, “So what did Putin actually get out of the deal? How has he benefited from this so-called collusion? What is Trump doing, overtly or covertly, that is of enough value to Putin to be considered payback? Hmmm? Well, early on there was the matter of sanctions, which the left was quick to call “easing” on drilling in Russian territories and on technology transfers – but the nature of these has been questioned and has not been found to be out of line with any revisit of sanctions by one nation against another upon the change of administration. The fact is that the US, following Reagan’s principles, has completely dominated global oil production in the last four years, replacing government “sanctions” with simple, tough economic competition. In 2017, though, Trump signed a bill placing sanctions on Iran, North Korea, and Russia – and later that month ordered the closing of three Russian consular offices in San Francisco, Washington, and New York – and in response, Russia ordered that 755 American diplomats leave the country within 30 days. Is this just window dressing? Contrived proof that no collusion existed, for the protection of Trump and Putin? In October of that year, Trump appointed Jon Huntsman as ambassador to Russia, who said, ““I need to be very honest about the current perceptions of Russia now in the United States. Events over the past year, in particular, have led many Americans to believe Russia wants to undermine American democracy.” Hardly a proffer of peace or “reward” for Russia’s supposed help in getting Trump elected. So again, I ask – what was in this whole collusion thing for Putin? In January of 2018, the Trump administration decided not to implement sanctions on Russia as part of the “Countering America’s Adversaries Through Sanctions Act”, causing some Republican Congressmen to question the motivation behind that – questioning if it might be a sign of weakness … maybe this is Putin’s payback? Is it possible that all the other harsh measures really were just a smokescreen to make it look like Trump was being tough on Russia to divert attention from collusion? But wait – two months later, Trump imposed additional sanctions on Russia for cyber-attacks and meddling in the 2016 election. My point is that I think your logic is deeply flawed. One can apply your checklist to either side – but often it comes down to what people say versus what they do, and how those actions and results fit in with the stated agenda. With Global Warming, the money transfer and usurpation of government power fits just a little too neatly into the over-arching agenda of the Left, and (one would think, anyway) that those with the loudest voices would at least be attempting to lead by example. And with Russia, one might look at the election and think that collusion is entirely possible, but post-election, a reasonable mind might look for some benefit for Putin as a result of his help, but the facts point to the opposite. Of course, some of the actions of the left during the election are extremely suspicious, but there has been no similar investigation of the Clinton campaign – between the activities of Fusion GPS, the origins of the Steele Dossier, the email chain indicating the links between these entities and the FBI and Justice Department (don’t forget, this all took place during the Obama administration, when Hillary Clinton was still Secretary of State). There is very credible evidence that Clinton hired Steele to dig up dirt on Trump using Russian sources. If this were truly a non–partisan effort to root out Russian interference, shouldn’t we expect a similar effort there? And in the end, it is the Left, with their two-year, $25 million abuse of taxpayer dollars, who have handed Putin exactly what he wanted in the first place – distrust of American government on the part of the citizens, an erosion of confidence in the American electoral system, the weakening of the American president, general turmoil among the general population of the United States, and the strident opposition to the president on the part of half the people, nearly all of the press, and of a pretty solid chunk of Congress. So you can keep your logic. I’ll follow the money and power, and look to the results, checking to see whose agenda they actually support.